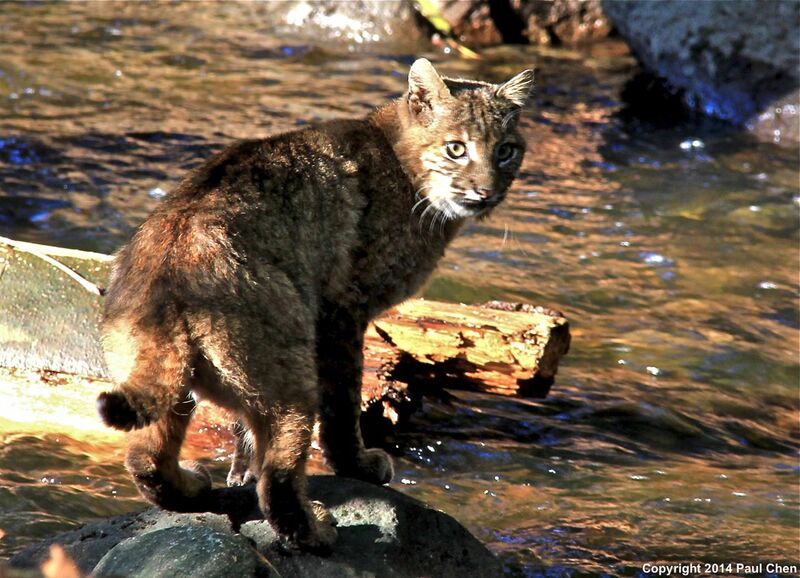 We’ve got salmon returning to our creeks once again, the coyotes are still howling at the passing emergency vehicles, and for the past few months, we’ve had a bobcat active in Deer Lake Park. This is life in the city that’s really hard to equal. I’ve been waiting eagerly for a couple of months now to make this post. Bobbie (gender unknown), has been putting in regular appearances throughout Deer Lake Park, and during the summer was a regular in my neighbourhood on the park’s southern edge. But I couldn’t get a picture! In fact, for more than a week, I hadn’t even seen the feline when everyone in my household and many of my neighbours had – frustrating, even for a bird guy. Without a picture, how could I make a decent blog post? Then finally, a visitor from Taiwan, Paul Chen, took the wonderful image above. Thank you Paul, for allowing me to use it here. It’s probably a surprise to many readers that bobcats and humans can live so peacefully together. It’s remarkable what happens when we don’t persecute our wildlife, and we provide some habitat in which to make a living. This is a tribute to “untidy,” wilder parks that have habitats as close to “natural” as we can manage in the city. The payoff is huge. Keep Burnaby green (and a bit scruffy around the edges, please). Not that we haven’t had Bobcats in the City previously; I know of reports going back to at least 2009 at both Deer Lake and Burnaby Lake. But we urban dwellers are not used to seeing the larger species of North American wild cats, and we’re certainly not expecting to see them in the city. So, if surprised by one, we often jump to the wrong conclusion – cougar! 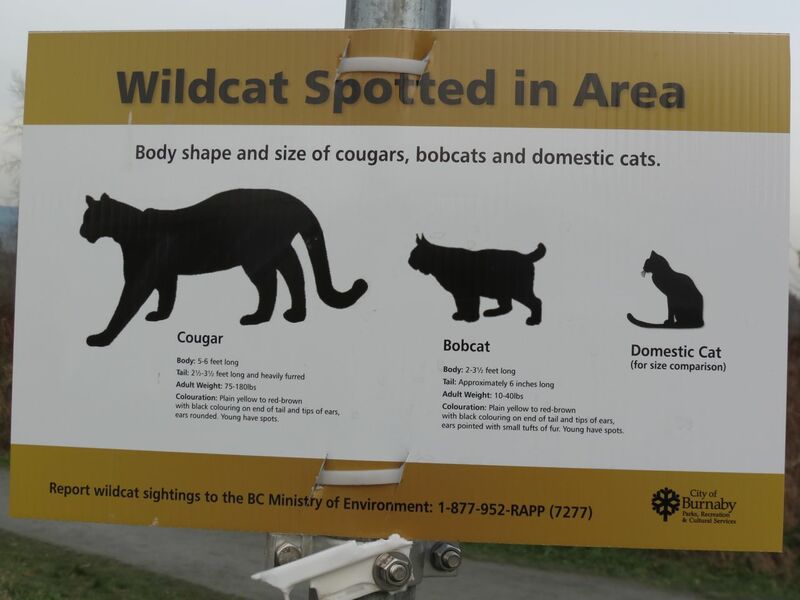 As you can see from the above signs posted this fall in the park, park walkers were confused as to the identity of the large cat many had seen. City staff attempted to put people at ease, and so posted a number of the above signs. However, it’s hard to win when you’re trying to put people at ease. 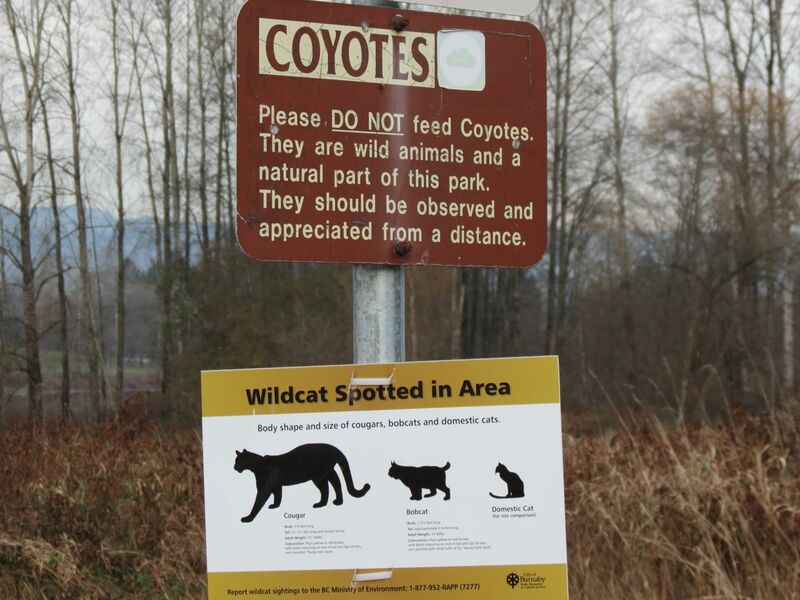 Some people interpreted the signs to indicate there could be a cougar in the area. Oh well! A close look at the real bobcat picture above shows that the one living here does not quite fit the silhouette shown on the sign. Our Bobbie is proportionally longer legged, and generally more slender. However, the short, black-tipped tail is diagnostic for the species. A bobbed tail gives it its name – bobcat. Bobcats are carnivores, and the literature suggests rabbits and hares are favourite prey, neither of which is common in Burnaby. When the cat was active in my neighbourhood it was feeding on gray squirrels and its hunting technique was interesting. My neighbour’s apple tree is always a favourite source of food for the squirrels in the fall. If you’ve ever watched a squirrel carrying a pilfered apple in its mouth, you’ll recognize that it must be seriously visually impaired. Bobbie would lie in wait and pounce as Nutkin was about to leap the fence with its prize. Twice it was seen in the early morning carrying captured squirrels over the fence. It seems too that they were eaten out in open on the lawn. This is one relaxed bobcat. The apples, of course, were always left behind. 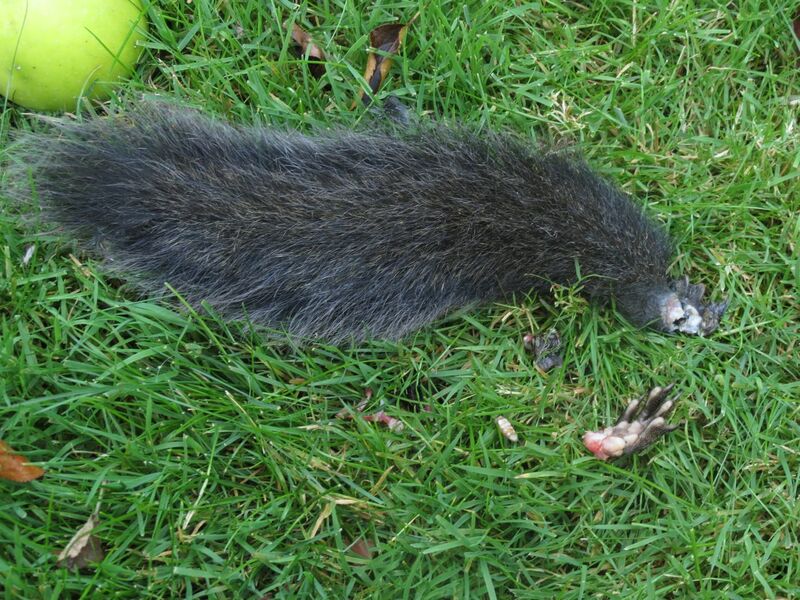 No apple sauce with squirrel dinner for this predator. Since the Eastern gray squirrel is an introduced species, I am pleased that the population is feeding this beautiful, native cat. It’s clear from our experience here that bobcats can live well on urban fringes, and this is being noticed throughout the continent. In Deer Lake Park there are plenty of Townsend’s voles in the meadows that would also provide food. As the picture above shows, perhaps bobcats would avail themselves of some salmon too if available. They are beautiful, opportunistic predators that we are so fortunate to have living with us. However, they are wild cats feeding on whatever they can find so we have yet one more reason to keep our domestic cats indoors and to make sure other small pets are leashed. And as the sign indicates there’a at least one other predator abroad that should encourage us to keep our pets protected. 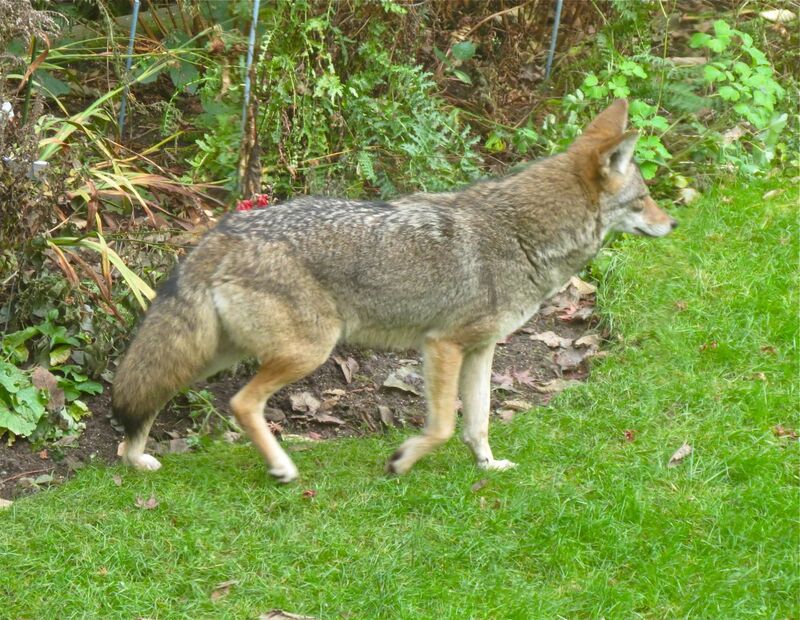 Yes, it’s the coyote, the other large, four legged predator in our parks. I’ll be leading a walk for the City of Burnaby on Saturday, November 22 – rain or shine. The walk is billed as: Exploring the Still Creek Corridor & Central Valley Greenway. We’ll spend about three hours walking the trails bordering Still Creek from where it flows into Burnaby Lake. Registration is required, and is limited to 15 participants. I’ll focus on the birds, of course, but we’ll keep our eyes out for all aspects of the natural world. 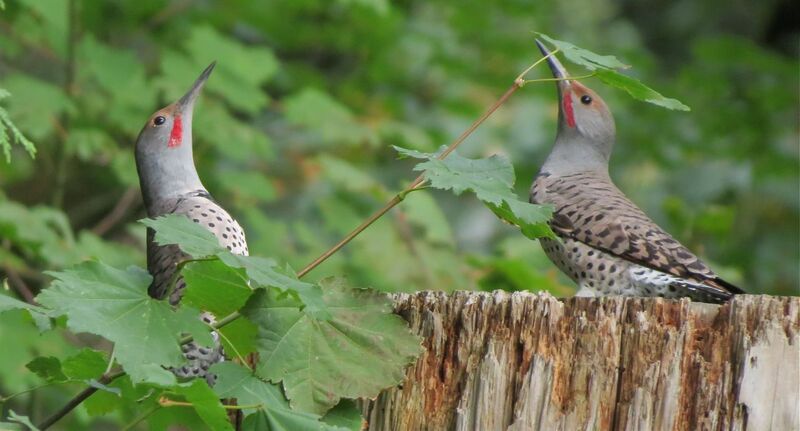 The Northern Flicker is the most likely woodpecker species to be encountered on the walk. Here are two displaying adults from earlier this fall. To register, go to the City’s website WebReg page and enter event number 350173 into the search box. The walk is not in the Parks and Leisure Guide as it was organized after press time for that publication. There will be lots to see, and with the wet weather lately we may be lucky enough to find some interesting fungus like this bird’s nest fungus (how appropriate!) I photographed a couple of days back in Deer Lake Park. 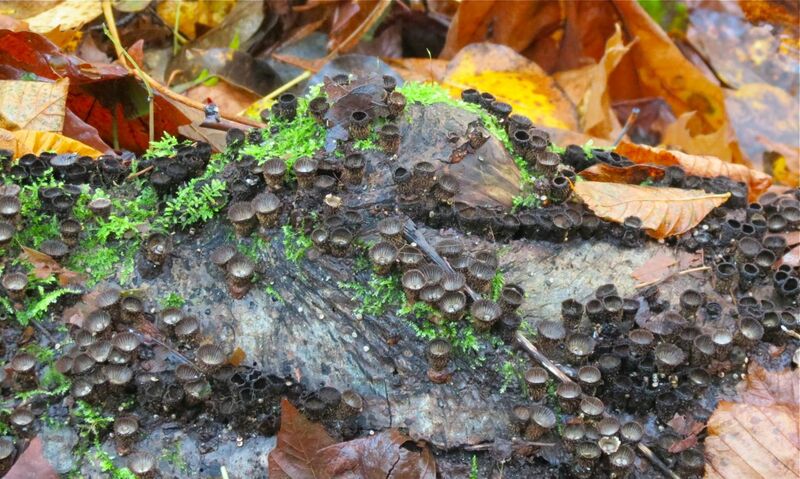 Bird’s Nest Fungus growing on decaying wood. The close-up below shows the still developing cups covered in a white membrane that will split away to reveal the egg-like peridioles held within. 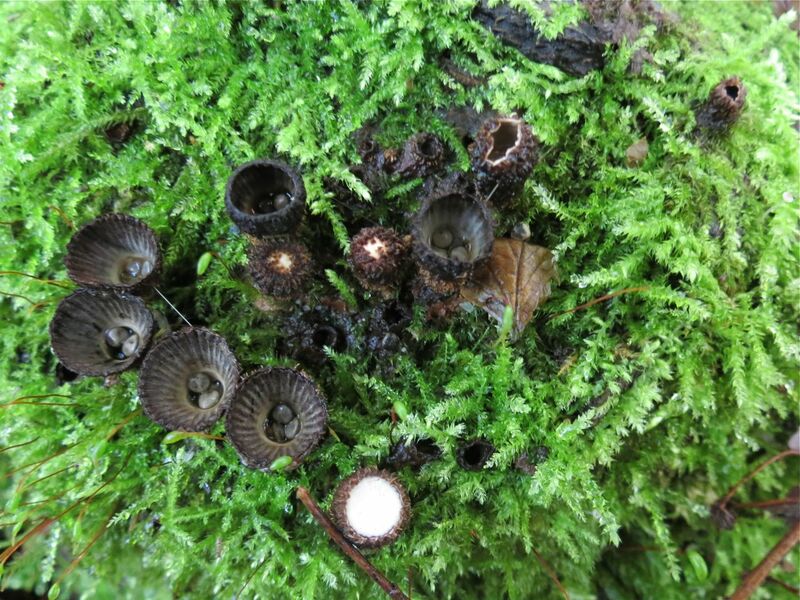 Because I’m a birder and not a mycologist, I’m not able to tell you the actual species of bird’s nest fungus pictured here; there are many. Perhaps a reader can help.